After a 23-10 season-opening victory over the Cleveland Browns, the Miami Dolphins will look to open the season 2-0 as they travel to take on the Indianapolis Colts. The Colts are coming off of an 11-5 playoff campaign in 2012 and Indianapolis 23-20 victory over Miami last November helped change the course of the season for both teams. November 4th of last season, the Dolphins and Colts met in Indianapolis with each team in the thick of the AFC playoff race with identical 4-3 records. 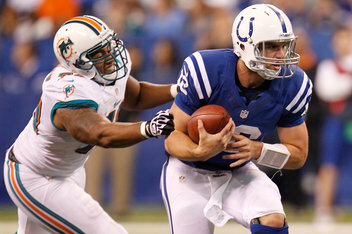 The Dolphins jumped to a 17-10 lead that day with just over five minutes to play in the second quarter. But behind 433 yards and two touchdowns passing from rookie quarterback Andrew Luck, the Colts rallied. The win that day for Indianapolis triggered a finish to the season that saw the Colts win seven of their final nine games while Miami fizzled going 3-6 over its final nine games. The key statistic that day was not Luck's 433 yards passing or the Colts 516 yards as a team. Instead, it was what they did on third down going 13-for-19 and keeping the Dolphins defense on the field. It was not only the fact that the Colts converted third down after third down, it was the third downs in which they converted that made last season's loss so frustrating. Throughout the day, Indianapolis converted a 3rd-and-10, 3rd-and-11, 3rd-and-12, 3rd-and-14, 3rd-and-16 and even a 3rd-and-20. Those six conversions on third down led to all, but three of the Colts 23 points that day. As is the case with most NFL games, third down conversions will once again play a huge role on Sunday as the Dolphins look for their first 2-0 start since 2010. Miami is hopeful that Sunday's contest has much more of a resemblance to last week's opener in Cleveland rather than last year's game in Indianapolis. In Week 1, Miami held Brandon Weeden and the Browns to a dismal 1-for-14 on third down including a 0-for-9 effort in the second half. Obviously, Weeden does not have the athletic ability of an Andrew Luck and is not as proven a NFL quarterback, but the effort by the Miami defense was impressive nonetheless. While the Browns couldn't seem to move the sticks on third down, Ryan Tannehill and the Dolphins offense proved to be very efficient. Thanks largely to the effort of Tannehill, the Dolphins were 8-for-16 on Sunday when it came to converting third downs with Tannehill going 8-for-12 with 81 yards on third down. Though last season's loss at Indianapolis helped lead to Miami's downward spiral, Sunday's contest presents the Dolphins an opportunity for the opposite effect. Despite winning by the third largest margin of victory throughout the NFL in Week 1, Miami's victory over Cleveland went largely unnoticed. Should Miami become just the second team to win in Indianapolis during the Andrew Luck era, just maybe a few more heads will start to turn. Mike Ferguson is a staff writer at Dolphin Shout and the founder and editor of Outside the Redzone. Like Outside the Redzone on Facebook! Also, follow Mike on Twitter @MikeWFerguson.